Wednesday, 2 January 2019, 10:29a.m. 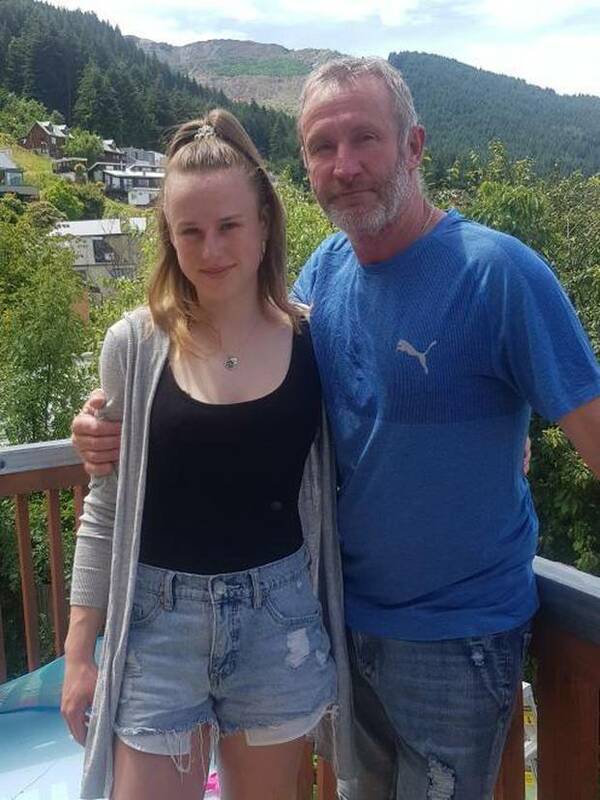 A father whose boat sank in Queenstown on New Year's Eve said he and the children aboard had ''less than a minute'' to abandon ship. Mark Grieve, of Fernhill, said their experience served as a timely reminder to everyone on the water this summer. Grieve was driving the 6m Hartley boat in Lake Wakatipu off Sunshine Bay about 7pm on Monday when it started taking on water. He was with his 17-year-old daughter Payton and Ella Kersten, 9. They were towing Porsche Jarvis, 15, and Benjamin Baker, 12, on a double ski biscuit - a water sports inflatable on which people can sit. ''A section of the boat gave way underneath the motor,'' Grieve said. ''No warning. It happened in less than a minute. We had less than a minute to get off board. ''My daughter was very calm and between her and me we managed the situation pretty well - weighed up our options. ''It's a timely reminder. We were joking and laughing about it last night but in reality it was a close call. Mark Grieve and daughter Payton after their boat mishap. ''Everybody had life jackets. Another key factor was we had a flotation device [the biscuit] so we were all able to stay together in the water. The five were rescued by operators of the commercial jet-boat KJet, and a private boat, and taken to shore. The lake, New Zealand's third-largest at 45.5km long, 11.6km across at its widest, and up to 300m deep, has a water temperature ranging from 8 to10degC. It has claimed many lives over the years. ''It was a reasonable amount of time to be in the water. Grieve said he was sure to always have an adult or older teenager on board with him, while he was driving the boat. They had been at the lake about six hours with others, who were on shore. After having a barbecue and swimming, they had been doing circuits towing the biscuit for about two hours. They were about 3km from shore. He said the older children handled the situation well. ''Ella was a little bit in panic mode, being so young, but the others are a little older. The families warmed up at home before watching the New Year's Eve fireworks while having a very late barbeque. Grieve said he has not fully assessed what happened with the boat as yet. It was dark by the time it was brought to shore. Mountaineer and Alpine Cliff Rescue leader Chris Prudden had raised the alarm from Fernhill Road, after fortunately spotting the boat in trouble. Harbourmaster Marty Black said: ''It just shows you [how] easily things can happen and if you're not prepared for things going pear-shaped, we could have had fatalities. ''Fortunately, they all had life jackets on, the kids had wetsuits and life jackets on. ''But there's a warning. Just be careful out there. Check your equipment — obviously something went wrong with the boat. That's plan A.